In each episode of Kind of a Big Deal you can listen to an exclusive and intimate conversation between our Features Editor and the kind of big deal folk our world-class arts scene attracts – writers, performers, movers and shakers. Listen again to Kind of a BIG Deal S02E03 ft. Neil Mackinnon, Head of External Affairs at the Edinburgh Festival Fringe Society HERE. 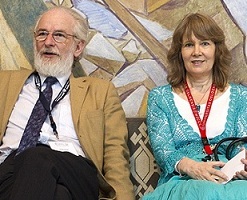 David Crystal is perhaps best known for his two encyclopedias for Cambridge University Press, The Cambridge Encyclopedia of Language and The Cambridge Encyclopedia of the English Language. His recent books include Words in Time and Place: Exploring Language through the Historical Thesaurus of the Oxford English Dictionary (2014), You Say Potato: a book about accents (2014, with actor son Ben Crystal), and The Oxford Illustrated Shakespeare Dictionary (April 2015, also with Ben). Hilary Crystal is a former speech therapist and one time quality-control editor for the Cambridge and Penguin families of encyclopedias. In 2013 husband and wife published Wordsmiths and Warriors: the English-Language Tourist’s Guide to Britain. In this conversation David & Hilary talk about their shared passion for language, accents and Shakespeare in original pronunciation (OP). This season of Kind of BIG Deal interviews is supported by the good people at the superb Cult Espresso – the coffee lover’s Southside choice.